The vielle is a bowed stringed instrument. It is a European instrument. It was used in the Medieval period. It is similar to a violin. It has a longer and deeper body than the violin. The vielle was also called a fidel or a viuola. Vielle is the French name for the instrument. It was one of the most popular instruments of the Medieval period. 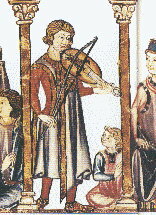 The vielle possibly came from the lira. The lira is a Byzantine bowed instrument. It is closely related to the Rebab. The Rebab is an Arab bowed instrument. This page was last changed on 3 October 2013, at 02:59.